They say it is lonely at the top. Evidently that's been true for the Punto 90. Well up until now at least. The car has been sitting on the throne of the most powerful diesel hatchback for a while now. So far, nobody has been able to challenge that. Last month though things changed. A new challenger appeared. One with a heart that has the same makings as the Punto. This is Tata's offering for the budget dieselhead, and they call it the Vista D90. that finishes second. This despite the car being more powerful and lighter. The Vista hits the ton in 15.48s and crosses the 400m marker in 19.87s. The Punto however loses by only a whisker. The car takes 15.61s to hit 100kmph and does a 19.9s quarter mile time. Both cars max out at a little over 160kmph. In terms of fuel efficiency, the Punto scores over the Vista returning 15.5kmpl in town and 19.18kmpl on the highway translating to a 16.41kmpl overall figure. (1.4kmpl, 0.78kmpl and 1.24kmpl respectively more than the Vista to be exact). A performance diesel hatchback is expected to display good dynamics and it's the Punto that wins hands down in this department. The car holds its line well around corners and is very composed. The steering is more direct and has much more feedback than the Vista's lifeless and light steering, at high speed one needs to hold the Vista's wheel quite firmly. The Punto chassis has the potential to handle more power if needed while the Vista starts to get hairy at high speeds. Tata engineers have worked hard to improve the Vista's ride quality but it's still not at par with the Fiat. The Punto glides over potholes and rough sections making the Fiat the obvious choice. The Vista may be smart and clean to look at in standard form but the Punto is more attractive. Though the car has been around for quite some time now, it is still one of the most attractive hatchbacks one can buy in the country today. The Vista D90 gets the Manza's updated face, chrome detailing and add on optional accessories like a front lip, side skirts and rear spoiler but this makes it look like a girl with heavy makeup. Tata designers have tried to give the car a sporty look but we believe the standard Vista is more pleasing to the eye. The Punto is an Italian beauty queen, the smooth flowing bodyline with subtle sporty detailing makes it the better looker. Inside, both cars display similar quality levels. 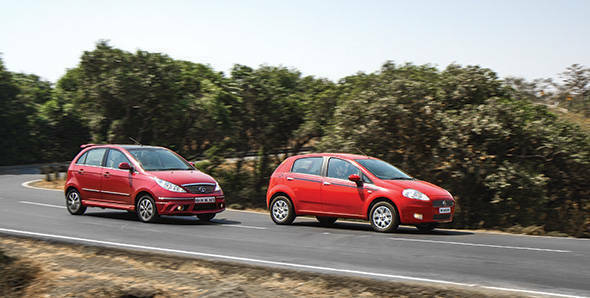 Tata has improved the overall fit and finish while the Punto's quality has gone down from when it was first launched. The Vista D90 gets the same dash from the Manza which means the speedometer console has moved from centre to the right side of the dash. However in terms of interior design, it's the Punto that comes on top again. So who wins? The Vista may be slightly quicker than the Punto and feature some extra comfort features like a touch screen stereo with navigation but that's about it .The Fiat scores over the Tata in every other area. In terms of pricing, the Vista is priced at Rs 6.94lakh while the Punto can be yours for Rs 7.60 lakh (all prices ex-Mumbai) and if you're lucky your local dealer may even offer you a cash discount. But for Rs 66,000 more the Punto is a more grown up and mature package and is the choice of these two for the budget diesel head.